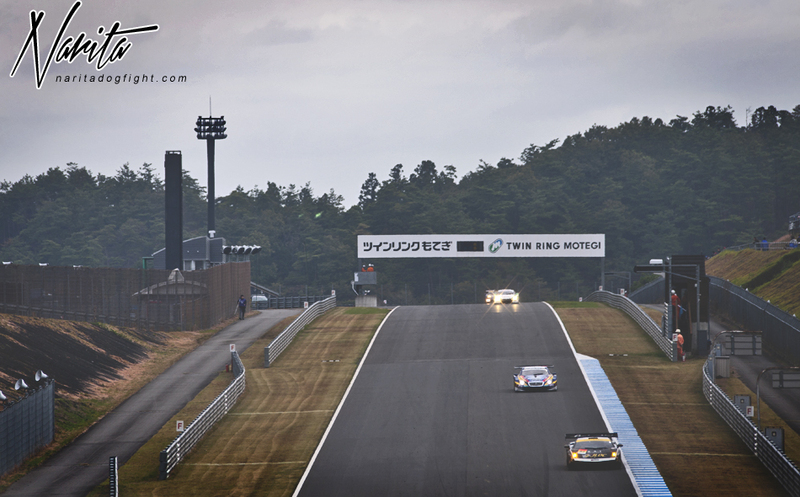 So, it was 5am and the only thing I could think about was getting caffeine into my system; not if my friend was going to be late, not if it was going to rain in Motegi, not if the pole sitter would win, not if that girl last night actually liked me or was just being polite. The only thing I cared about was coffee. 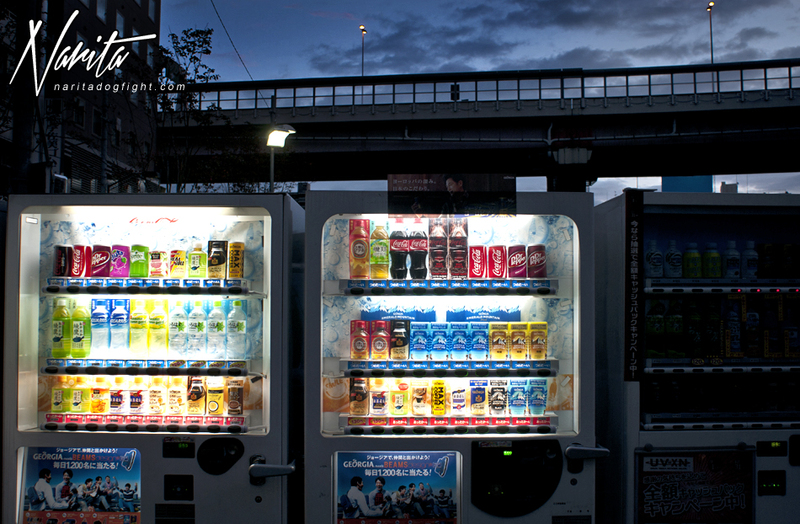 So I did what any normal person in Japan would do; walk across the street and buy one. 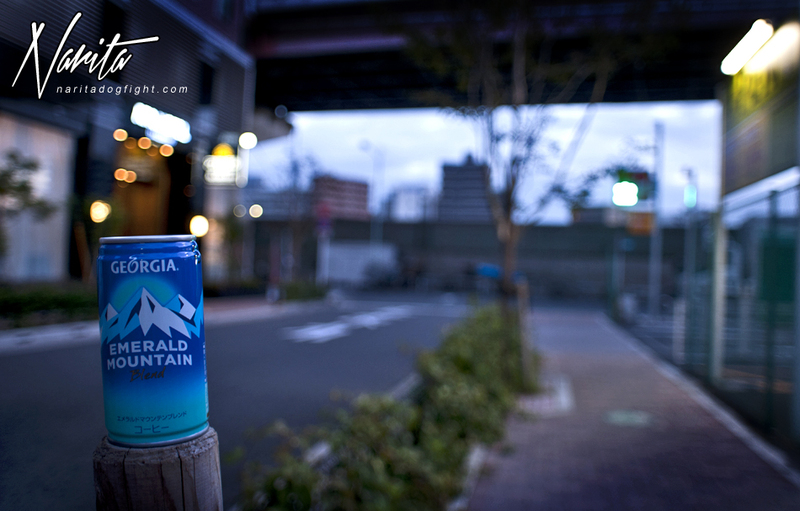 I ended up getting a warm Emerald Mountain Blend, as I usually do at this, or any, hour. Well, that’s a lie, most of the time I buy it cold. 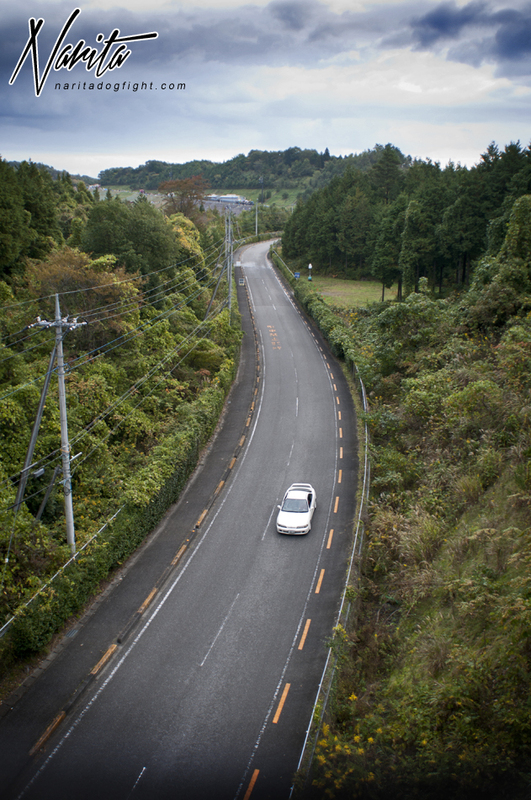 Anyway, I took a quick walk around the hood while I enjoyed my coffee and waited for my friend to pick me up to begin our journey to Twin Ring Motegi for the final round of 2012 Super GT. Next door to my place was a shop that had a couple cats roam around every morning; this was one of them. They always wandered the near sidewalks and alleys to make sure everything was how they left it the night before. This guy had just got done eating some cat food the owner had left out. 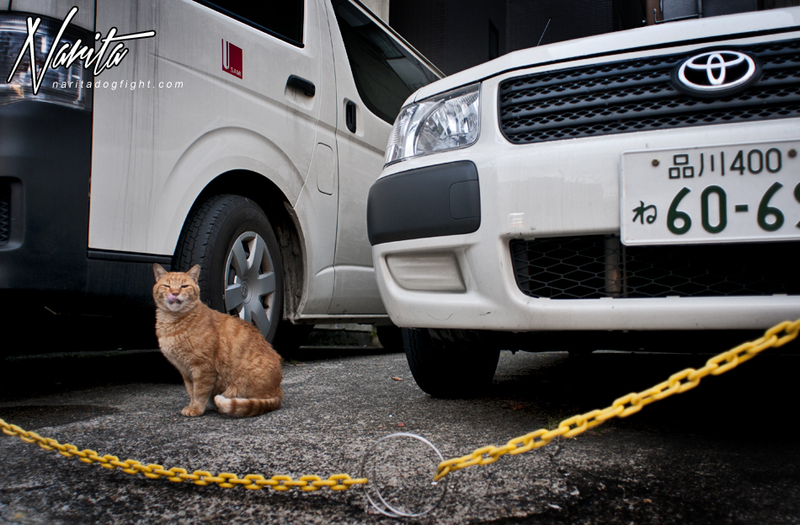 My friend showed up soon after the cat photo session, and we began our trip to Motegi. 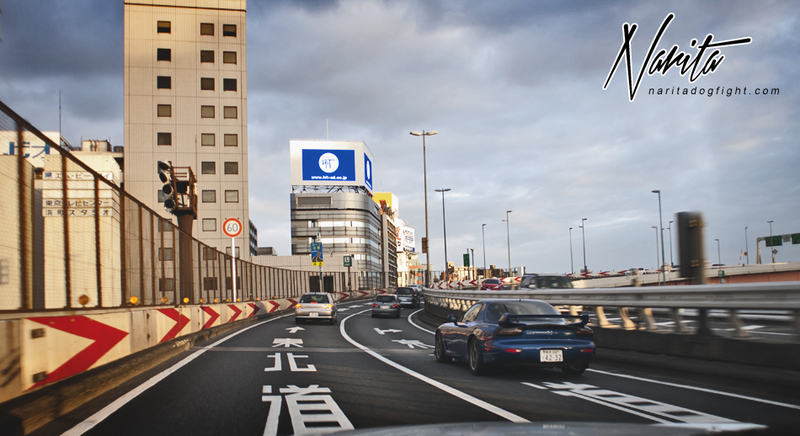 Weaving our way through the expressway, slowly making our way to the outskirts of the big metropolis that is Tokyo. Just driving around gives you opportunities to find cool cars; like this RX-7 we tailed for a short while. There is one particular Parking Area off the expressway that we usually stop at. 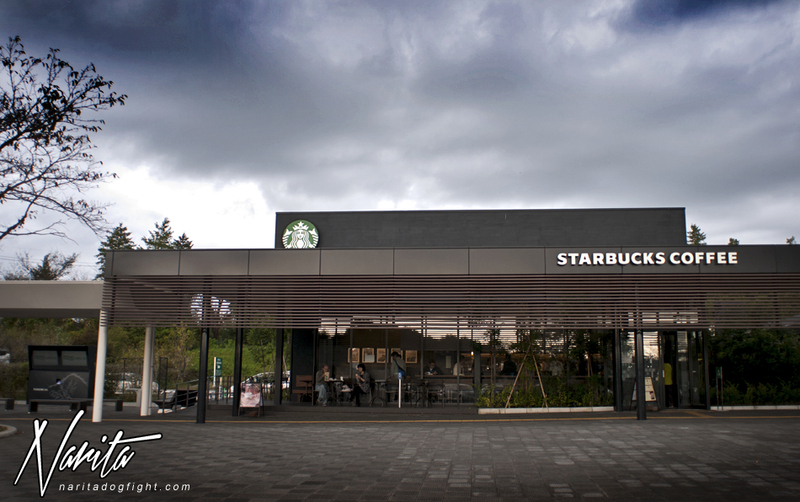 There is a Starbucks there that has some pretty cool architecture. The lot also provides a good place to find cool cars. This ER34 GTR looks great! Almost as great as the new Taylor Swift album. As we got closer to Twin Ring, we ran into a little traffic due to some construction that turned the already narrow road into one lane. The forecast that day called for light rain off and on; I was hoping it wouldn’t at all, but at this point it looked inevitable. 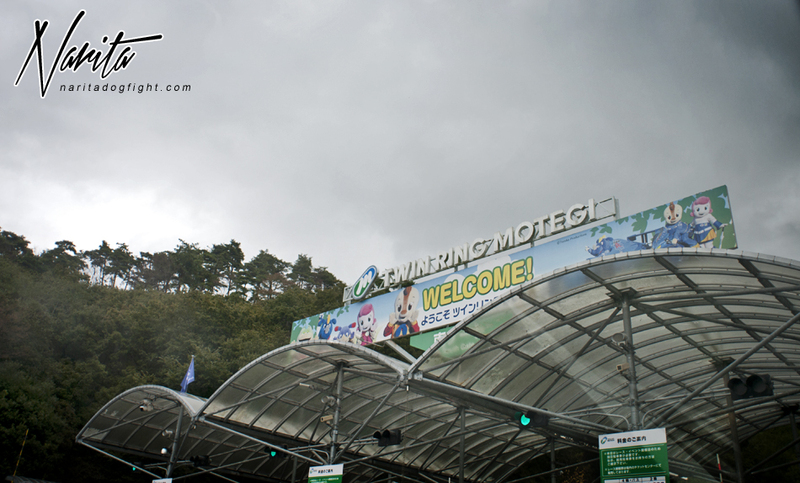 It seems like every Super GT race I go to it rains. I don’t really mind, because it makes for good photos, but it’s pretty bothersome in every other aspect. My buddy and I, who runs JDM Clips, both skipped breakfast that morning, so after parking the first order of business was getting a healthy meal…so we both got takoyaki; probably not the best choice for breakfast, but whatever. It was delicious, and hot. Very hot. After we got done eating our junk food, practice was just getting underway. 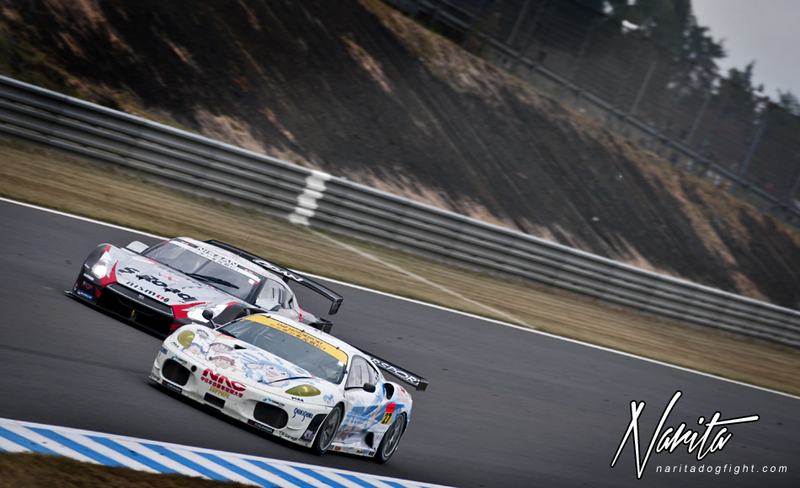 Before the Porsche Cup support race, the Super GT cars go out for about an hour long practice session. We decided to watch the entire practice at the Dunlop Corner, so we made the hike over there. Along the way we got treated to nice views like this between the trees that surround the track. The cars carry quite a bit of speed on the straight leading to this corner, so it’s neat to see them get hard on the brakes. Most cars had a similar breaking point, but you could definitely see a difference between the 300 and 500 cars. 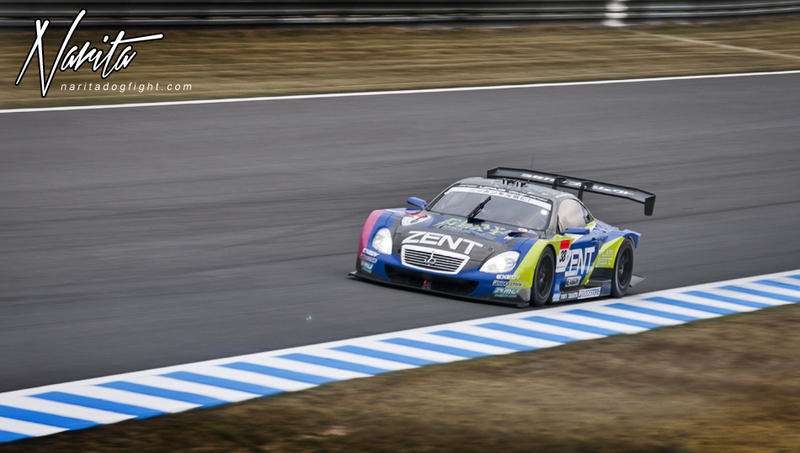 Here is the pole sitter, ZENT SC430, heading into Dunlop. 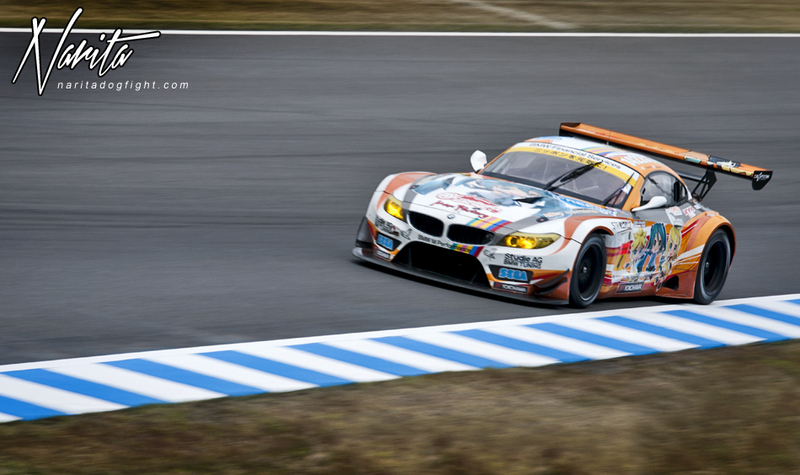 One of the BMW GT300 teams – this car unfortunately ended up going off in the gravel towards the end of the race and had to be towed off. It looked great during practice though. 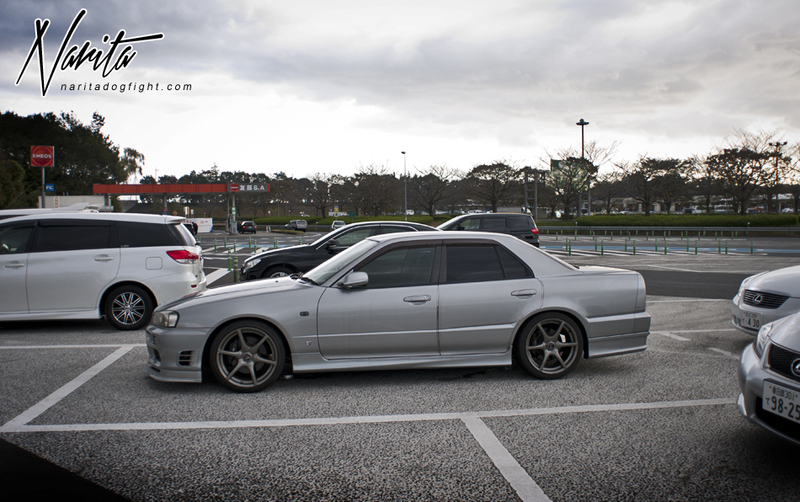 Another Lexus of the WedsSport persuasion. 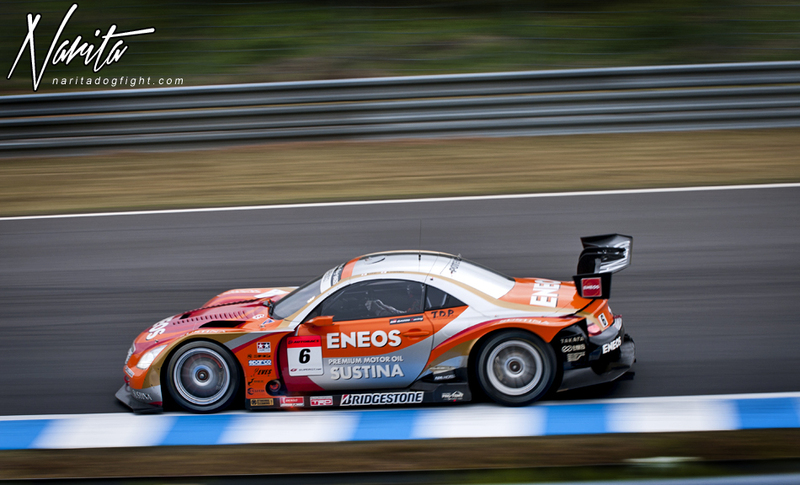 This car has cool livery. 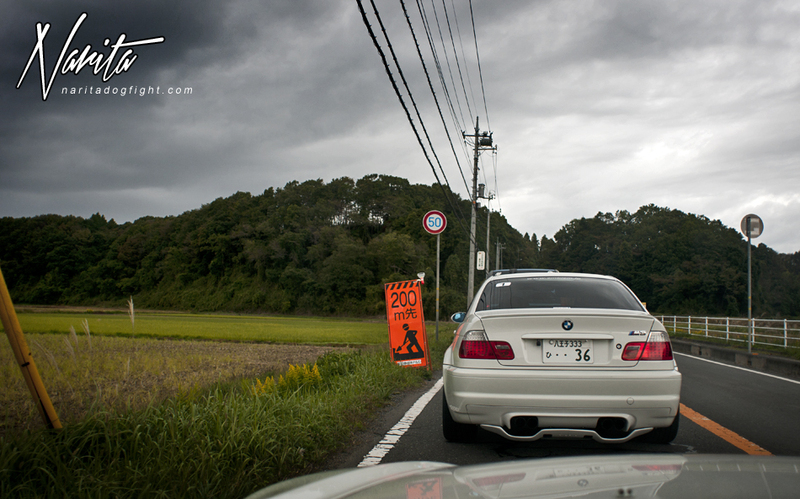 Drag race of epicness. 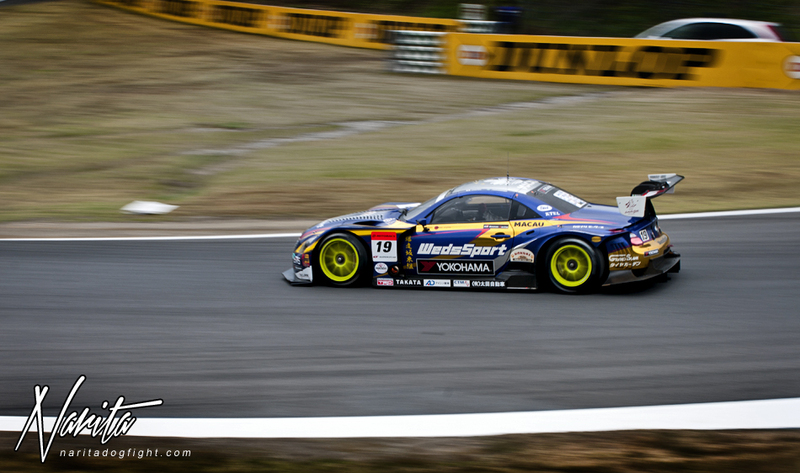 The S Road GTR of course had no problem passing the GT300 Ferrari. The S Road team had, at the last round, already captured the series championship. Another shot of the ZENT. If this car comes up often I apologize, as it is my favorite team; I may be a bit biased. I’m sure you’re all familiar with this track thanks to Gran Turismo, so you all should know about the tunnel after the Dunlop Corner. 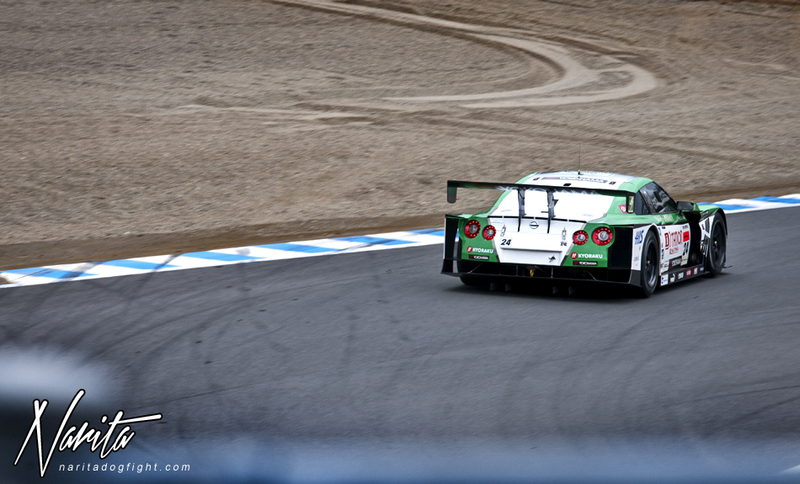 The engines emit an awesome noise as the drivers rocket through the tunnel at full throttle. Before getting on throttle though, you’ve got to brake. Hard. The brake rotors burn, and the catalyzer shoots flames in protest as the driver commands the car to slow. 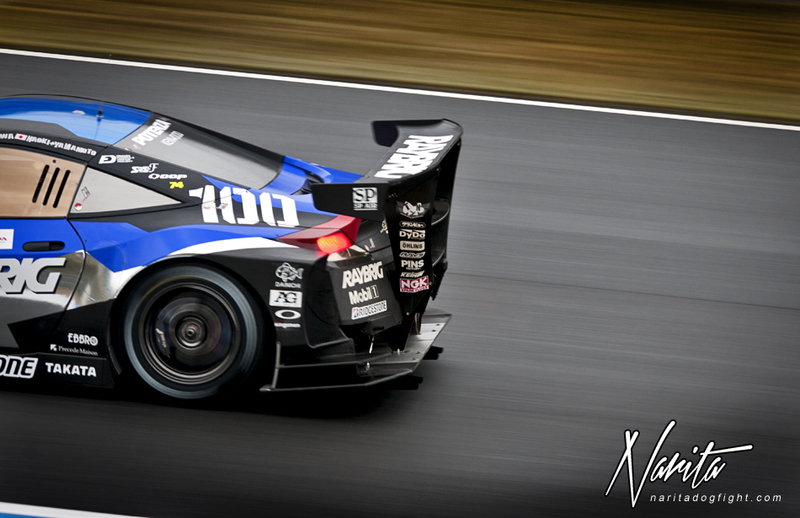 Head over to the wallpaper page to see how hot these brakes can really get on this turn. You can lead a horse to water, but you can’t make them drink. 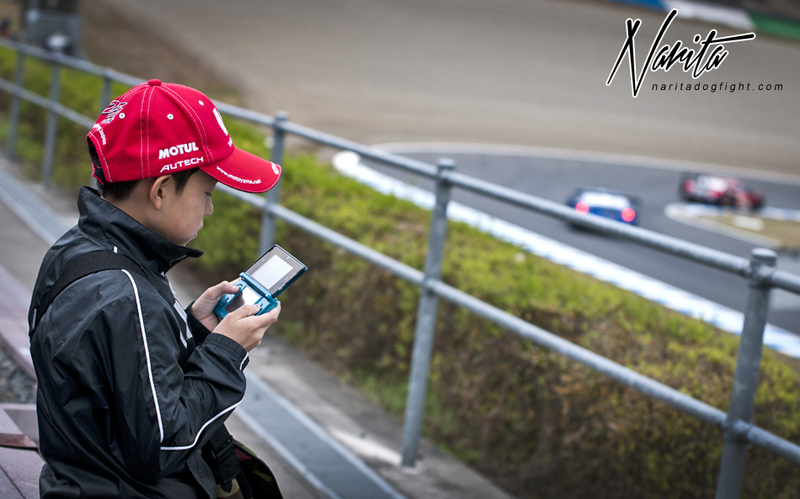 Some of the kids were more absorbed in catching pokemon than the screaming cars fighting it out on the track. I thought this was hilarious. 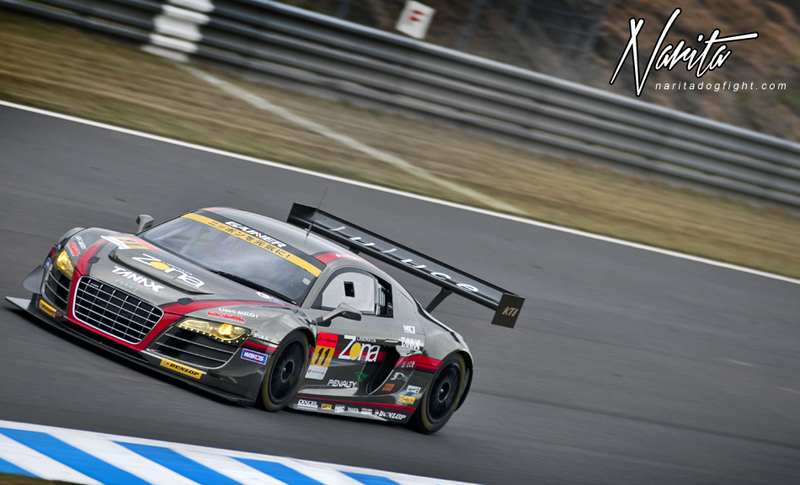 In the scheme of things, the Audi R8’s do relatively well in this series. 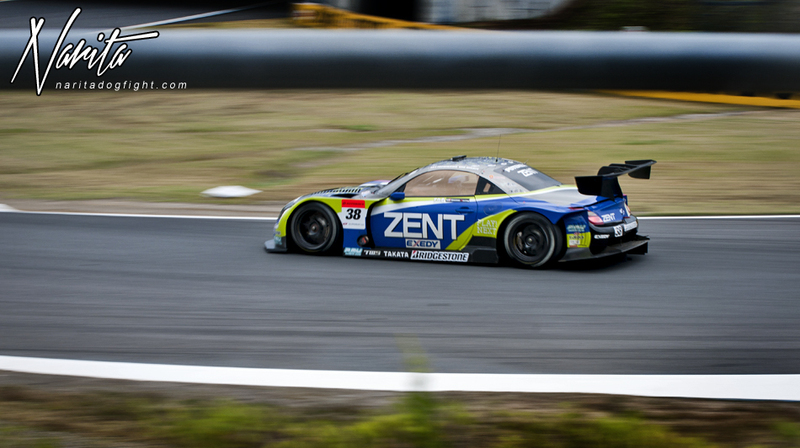 One consistent top 5 finisher is the GT300 Gainer R8. 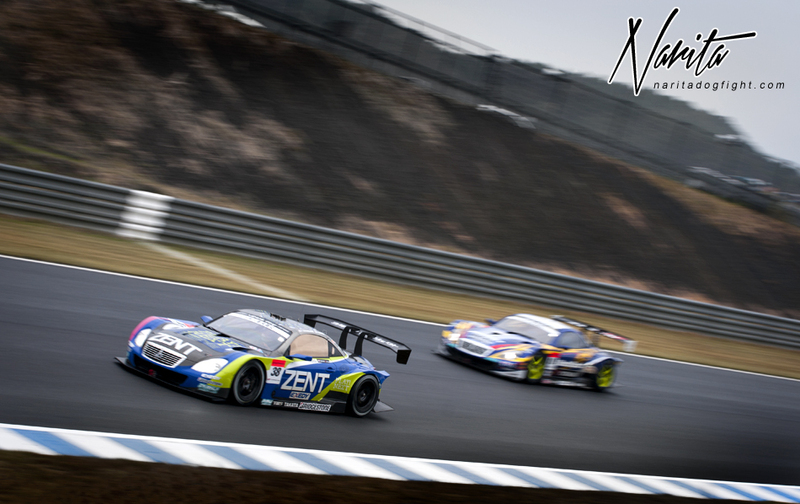 The upside of running two classes simultaneously is that, even on the more boring tracks, there is always overtaking. 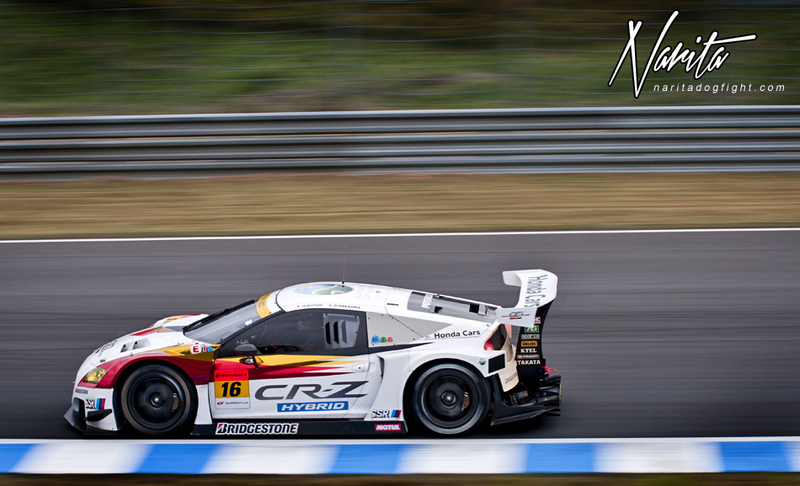 The CR-Z was pretty healthy sounding all day. I look forward to see what this car is capable of in the next season. 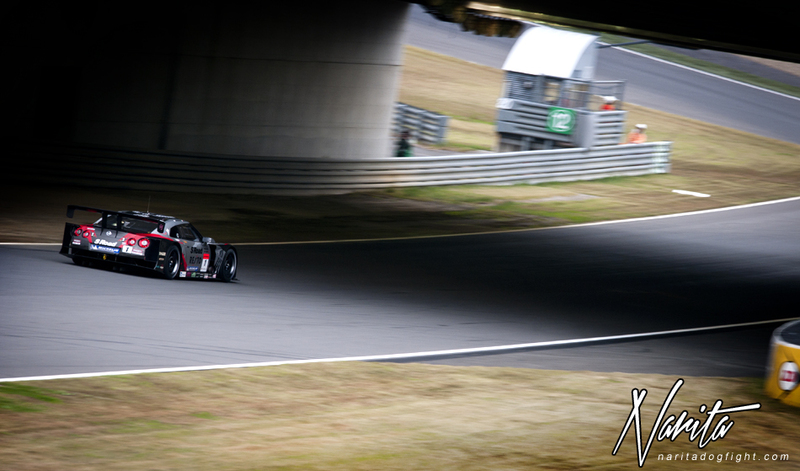 I was sure to take many pictures of the HSV competitors, as this may be the last year we get to see them competing in Super GT, due to some regulation changes. These cars were actually already an exception to the rule. After the quick practice session, we took a stroll over to the Honda Collection Hall where they were having a tribute to 90’s racing, specifically the NSX. It was a few hours before the beginning of the race, so I also took a stroll through some of the parking lots on the hunt for hidden treasure. I’ll have more on that later, as well as full coverage of the race. Stay tuned, and thanks for visiting! Wow those photo graphics are amazing. I definitely think the rainy/cloudy sky added a really nice touch. 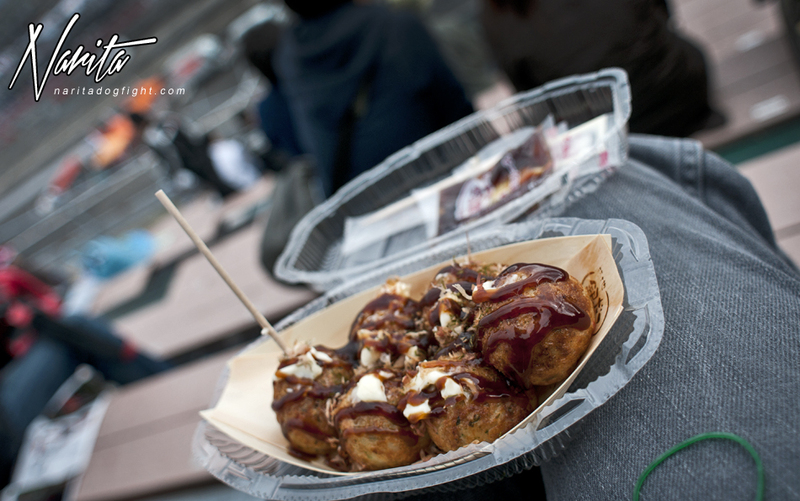 And that takoyaki looks good! 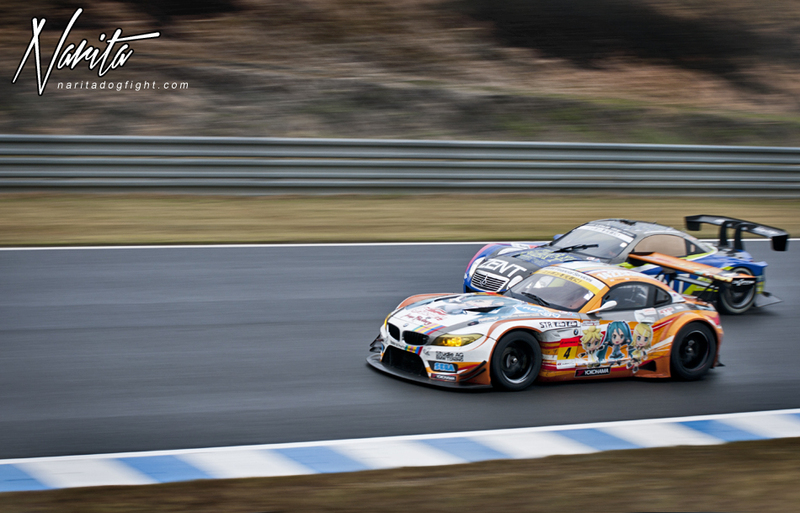 I think one of the things for my bucket list for when I ever go to Japan is go to a race! Thanks Joanna ~ I recommend it!